Tablet shown not actual size. Tablets should only be taken whole; do not divide, crush, chew, or dissolve. No additional benefit was demonstrated at doses greater than 10 mg twice daily. The risk of seizures increases with increasing AMPYRA doses. Adverse reactions and discontinuations because of adverse reactions were more frequent at higher doses. 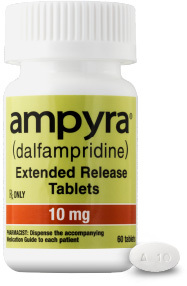 Patients should not take more than 2 tablets of AMPYRA in a 24-hour period. AMPYRA is cleared predominantly by the kidneys. The risk of seizures in patients with mild renal impairment (CrCl 51-80 mL/min) is unknown, but AMPYRA plasma levels in these patients may approach those seen at a dose of 15 mg twice daily, a dose that may be associated with an increased risk of seizures; estimated CrCl should be known before initiating AMPYRA and monitored at least annually during treatment.